With the types of spam that slips through the cracks here, I'm glad I don't work for a major corporation that has all kinds of policies for monitoring employees' email and drug testing. I can only imagine what might happen if such an employer came upon the all-too-common medz spam that implies the recipient has an ongoing business relationship. 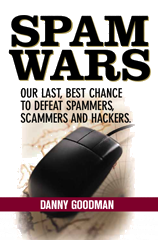 The domain name of the spamvertised Web site is quite apropos. Although the actual name uses numbers for some of the letters, the name can be deduced to read "fixcentral dot com." That's just great! This spam could put its recipient in the hot seat as a suspected Vicodin junkie. Whew! I'm glad there's no boss looking over my shoulder to catch me popping M&Ms like...candy.